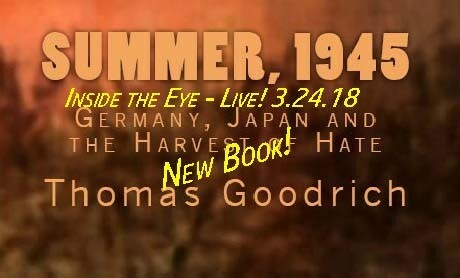 Summer, 1945 – Tom Goodrich's latest book offering – ITEL – 3.24.18 | Inside the Eye - Live! Tom Goodrich, author of “Hellstorm: The Death of Nazi Germany, 1944-1947”, came on Inside the Eye – Live! to announce the release of his new book, “Summer, 1945.Â Germany, Japan, and the Harvest of Hate”.Â The book if available directly through ThomasGoodrich.com and Amazon.com, among other distribution points. To spice up the interview, “Mary”, the lovely voice that graces the intro bumper to Inside the Eye – Live! Prime Time!, joined the show to speak with Tom for a few minutes during the opening segment.Â Listeners might appreciate some of that conversation. This book is about crime and the evil things evil men do. This book is about words and hate and the powerful price of propaganda. This book is about the savage, no-quarter war waged against Japan during the summer of 1945 and it is about the equally savage no-quarter â€œpeaceâ€ waged against Germany during that same summer, 1945. There is no attempt herein to recite the numerous atrocities attributed to the Germans and Japanese by the victorious powers. Certainly, some of these crimes were true; equally certain, many of these crimes were not. Such is winning and losing. Such is war. As with all “Fetch-Goodrich” interviews, this is just another great “down to earth” conversation from two seasoned veterans of the “truth movement”.